Implement NFPA 101® correctly in today's world. Your essential Code companion, NFPA®'s Life Safety Code® Handbook incorporates the complete Code text, commentary from seasoned professionals, and visuals into one go-to source. 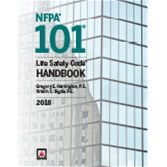 Trust the 2018 edition of the NFPA 101: Life Safety Code Handbook to help you make the right safety decisions in the built environment, where every decision has the potential to impact lives. For applications advice, nothing compares! This unique reference combines Code text and expert commentary, so you're better prepared to comply the first time and avoid costly mistakes, violations, and job delays. Interested in other editions of the Life Safety Code Handbook? Use the drop down menu above to select the edition year you need. Based on the 2015 NFPA 101®, NFPA®'s acclaimed Life Safety Code® Handbook incorporates full Code text, commentary, and visuals in a must-have resource. Any decisions you make in the built environment have the potential to affect lives. That's why you need the best source of applications advice: the 2015 NFPA 101: Life Safety Code Handbook. This resource combines Code text and expert commentary to help you comply correctly the first time and avoid costly mistakes, violations, and job delays. Side-by-side presentation of occupancy requirements for new and existing buildings for easy comparison -- this feature alone makes the Handbook a must! If public safety depends on you, look to the 2015 NFPA 101 Handbook for essential support. Interested in other editions of the NFPA 101 Handbook? Use the drop down menu above to select the edition year you need.